David Mizejewski works for the National Wildlife Federation in his day job, but in his spare time he's apparently a rather avid fan of Return of the Jedi's fluffy guerilla fighters, the Ewoks. In celebration of World Ewok Appreciation Day (!? 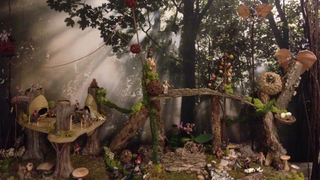 ), he shared pictures of his very own elaborate Ewok village display. There's lots of little details to love about David's set up - I particularly like that group of Ewoks bottom right just nonchalantly murdering a Scout Trooper - but most all I love that he's incorporated actual natural elements like tree bark and plants alongside his toys. There's always something wonderful about the combination of an action figure and 'real life' environments like that, and combined with my own soft spot for the Ewoks, it makes David's display all the more lovely. You can check out more pictures over at BoingBoing, linked below. Oh, and a belated happy Ewok Appreciation Day to you all!